Henna is a popular natural dye for the hair. A big plus dyeing with henna is that it not only spoils the structure of the hair, but, when used properly, strengthens them, makes it thicker and stronger. Minus the henna, it's so hard "marries" with our hair that it is almost impossible to wash out their structure. If you want to wash off or lighten the henna, remember that the sooner you do since staining this natural dye, the more noticeable will be the result. This is because the henna is washed out much of hair in two weeks, and then its color pigments as if "fused" with our natural pigments and wash them out of the hair structure can be very difficult. It is not necessary to repaint the henna with chemical dyes as a result of this staining can be, to put it mildly, unpredictable. 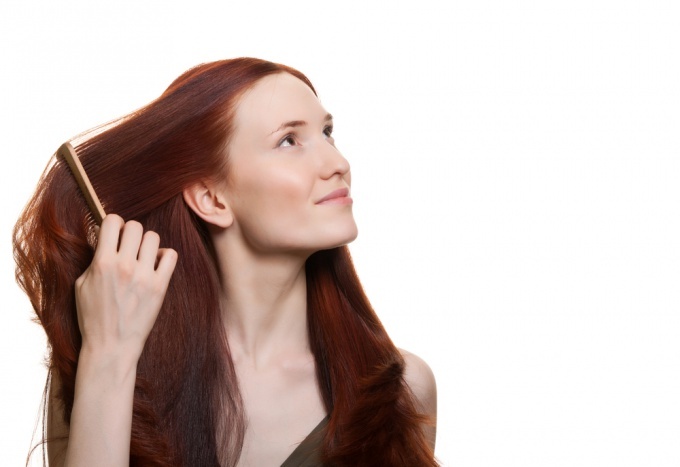 Many believe that henna on hair can be combated only with the help of scissors. There are actually a number of home ways to lighten henna. You should try to lighten up the red color after dyeing henna natural methods. So the curls will remain intact, and the color gradually go away. Of course, all the henna is not washed out of the hair structure, but either way, you will prepare them for further staining. - Try a mask with warm olive or burdock oil. Well they pull the artificial color pigments from the hair, restoring the natural color. Warmed oil should be evenly distributed throughout the hair and keep under warming cap (with a towel) for at least two hours. To make the color more intense stretch, the mask should be at least 3 times a week.- Oil to mask more effective, you can apply it together with alcohol. This will require a 70% alcohol, which moistened hair on all length. After five minutes, when the scales of the hair under the influence of alcohol opened on the head to apply the warm oil. Scales are revealed, and the color of the sky is much more active. The mask should be kept on the hair for half an hour under a warm cap. You can heat your hair using a towel. Rinse the head best shampoo for oily hair. Another option oil mask: wash your hair with bar soap, which also reveals the scales of the hair, then applied the warm oil again for 2 hours under a warm cap.- Yogurt and sour cream a bit mute color. These products are applied for 2-3 hours, then wash off with a shampoo for oily hair. For greater leaching the colors can yogurt mixed with a small amount of yeast.After applying any of the masks you can rinse your hair weak vinegar solution, which also lightens the henna.